Pittosporum tenuifolium ‘Loxhill Gold’ is a medium-sized, evergreen, bushy shrub, which grows to about 7.5 ft (2 m) high and 6 ft (1.5 m) wide. The spear-shaped leaves have green wavy edges and an irregular yellow centre, darker in winter. The small deep red male flowers in spring. 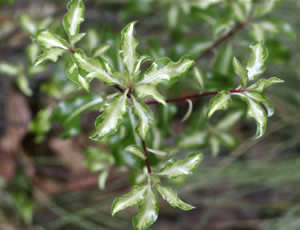 Pittosporum tenuifolium ‘Loxhill Gold’ is somewhat similar to ‘Tresederi’, but has darker green leaves. It needs a sheltered site in the UK.